This genus is accepted, and its native range is Europe, Medit. The Loteae have been usually considered as the closest relatives of other temperate tribes, especially of the astragaloid part of Galegeae (e.g., Polhill, 1981k: 371–374), and the monospecific genus Podolotus was either allied with Lotus, or merged with Astragalus. 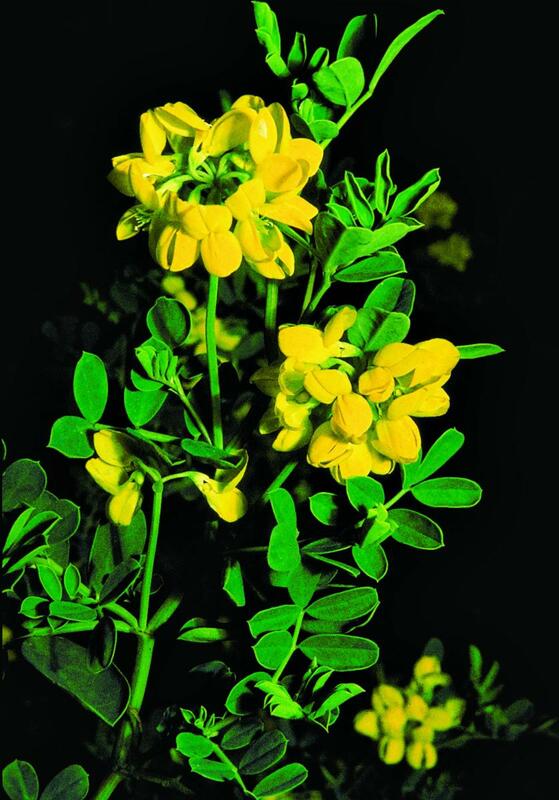 Recent molecular data, however, have revealed that Galegeae, Cicereae, Hedysareae, Trifolieae, Fabeae and Millettieae (in small part) lack the chloroplast-DNA inverted repeat (IR) which is present in the majority of Leguminosae including Loteae (Liston, 1995). A study of the chloroplast gene rbcL also placed Loteae and other temperate tribes in different clades (Doyle et al., 1997), the Loteae being in a robinioid clade and the temperate tribes in an Inverted Repeat Lacking clade (IRLC). In recent supertrees of the Hologalegina alliance (Wojciechowski et al., 2000, 2004), Loteae sens. lat. 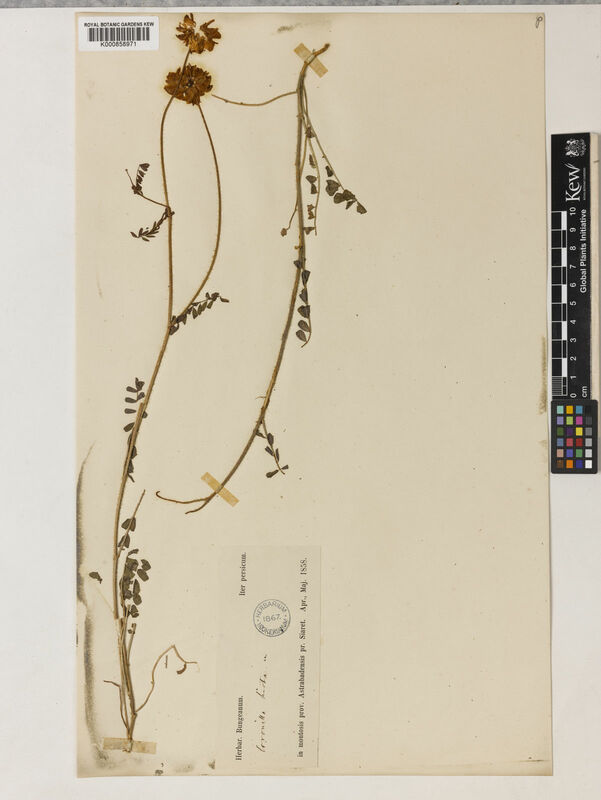 are sister to Sesbania, and the combined Loteae-Sesbanieae clade is itself sister to the Robinieae. Loteae differ from Robinieae in a suite of characters which were listed by Dormer (1945) for his ‘epulvinate series’, i.e., often herbaceous habit and leaves mostly distichous, usually without a pulvinus. These characters are now of less phylogenetic importance since the ‘epulvinate series’ is no longer considered to be a monophyletic group. An obvious synapomorphy of Loteae, shared by all extant members of the tribe, is stamen filaments dilated upwards. This is an adaptation for secondary pollen presentation. Another apomorphy shared by almost all Loteae is the capitate or umbellate partial inflorescence, while Robinieae possesses racemes. A most unusual (and possibly synapomorphic) morphological character of many Loteae is the presence of a foliage leaf on the peduncle. This leaf is often described as a bract, but it has neither a flower nor other structures in its axil. True bracts in Loteae usually lack a blade and are membranous or glandular. Phylogenetic evidence suggests the presence or absence of the foliage leaf on the peduncle is homoplastic within Loteae. The circumscription of Loteae has recently been expanded to include genera formerly placed in Coronilleae (Polhill, 1981k & l; 1994). These two tribes were previously distinguished by the lomentaceous fruits and branched root nodules in Coronilleae (fruits non-lomentaceous and root nodules unbranched in Loteae sens. strict.). The Coronilleae were earlier placed in tribe Hedysareae (Bentham, 1865) because of their lomentaceous fruits. The merging of Loteae sens. strict. and Coronilleae is supported by both morphological (Polhill, 1981k; Lassen, 1989; Díez & Ferguson, 1990, 1994, 1996; Tikhomirov & Sokoloff, 1996a) and molecular data (Doyle, 1995; Liston, 1995; Doyle et al., 1997; Allan, 1998; Allan & Porter, 2000; Allan et al., 2003). 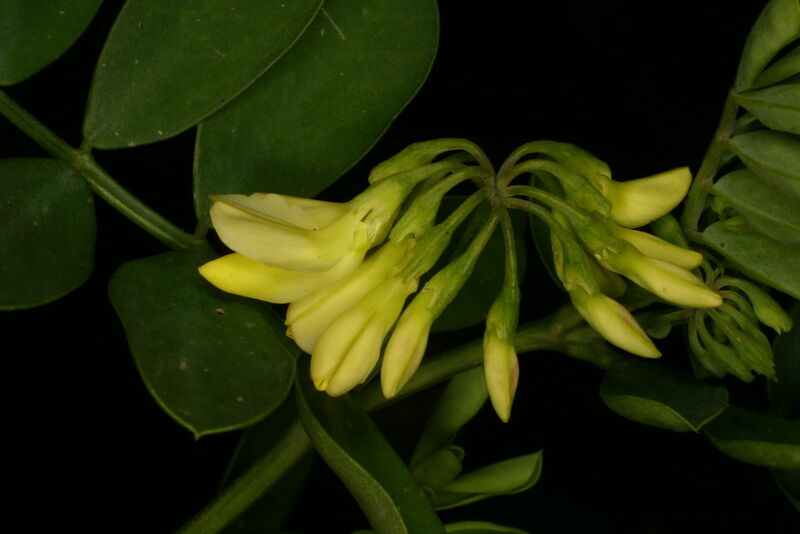 These data indicate that lomentaceous fruits have arisen independently in Coronilleae and Hedysareae, and perhaps even in different genera of Coronilleae. Allan & Porter (2000: Fig. 2A) suggested, however, that lomentaceous fruits were a plesiomorphic condition for Loteae sens. lat. 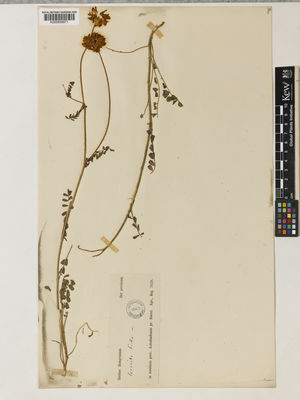 In our opinion, an ancestor of Loteae might have had dehiscent fruits divided into regular compartments by thin transverse septa (as in Sesbania and Lotus sens. lat.). The genera formerly placed in Coronilleae do not form a natural taxonomic unit at any level. Regarding fruit anatomy, lomentaceous fruits of Securigera and Coronilla are related to dehiscent fruits in the Lotus group, while lomentaceous fruits of Ornithopus and Antopetitia share important features of pericarp structure with the indehiscent non-lomentaceous fruits of Anthyllis and Dorycnopsis. Recent publications have led to the removal of some groups from Lotus sens. lat. 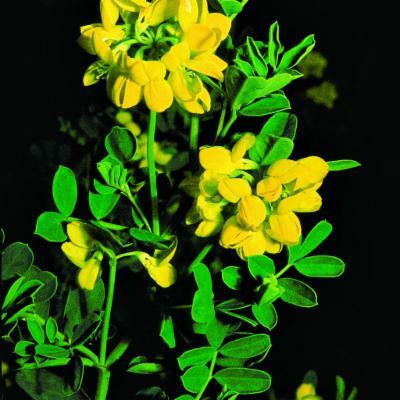 (Lassen, 1986; Tikhomirov & Sokoloff, 1997; Sokoloff, 1999, 2000), Coronilla sens. lat. (Lassen, 1989) and Anthyllis sens. lat. (Lassen, 1986; Tikhomirov & Sokoloff, 1996a, 1997). 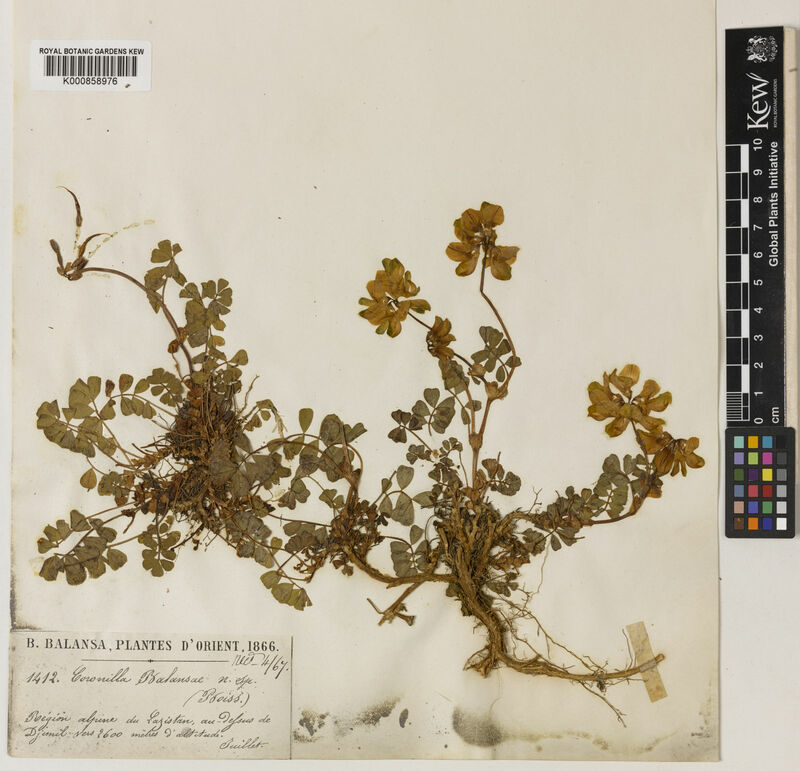 Morphological and molecular data relevant to the relationships between Old World and New World Loteae have recently been published (Díez & Ferguson, 1990, 1994, 1996; Kramina & Sokoloff, 1997a; Allan, 1998; Allan & Porter, 2000; Allan et al., 2000, 2002, 2003; Degtjareva et al., 2003). The placement of Podolotus in Loteae is now well supported by morphological data. Allan & Porter (2000) and Allan et al. (2003), using nuclear ribosomal ITS, concluded that Old World and New World Lotus sens. lat. belong to distinct clades. 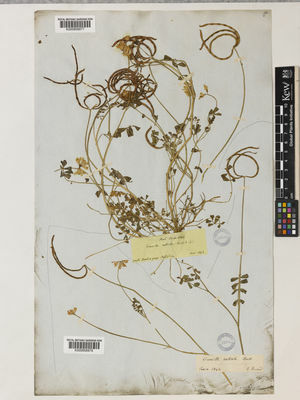 In the latter analysis, Old World Lotus forms a moderately supported monophyletic group if Tetragonolobus and Dorycnium are included, while New World Lotus is paraphyletic, also containing the Old World Ornithopus (although with 1 sp. in the New World) and Kebirita among others. In this treatment Loteae is considered to comprise 22 genera and c. 282 species (Fig. 51).